Ever since a deluge of zombies, infected by genetically altered tofu burgers, swept across the land, you've been on the run from their insatiable appetite. Unfortunately, your plans to escape by helicopter were thwarted. Will you manage to escape from the zombies yet again? In the latest chapter of the Zombie Solitaire series, you’ll discover a solitaire adventure game chockfull of fun surprises and pesky zombies. Don’t let them get you. Strike the undead with a diabetes Z sugar shock – it’s your most effective weapon! So, make sure you always have enough sugar ammo, stay calm and escape the zombie apocalypse in the most entertaining way possible! 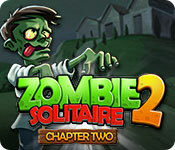 Zombie Solitaire 2: Chapter 2 is rated 4.8 out of 5 by 10. Rated 5 out of 5 by verimeri from really fun game I am getting hooked on this series. First of all the game play is good. Most of the rounds can be completed without too much difficulty or need for power-ups. However, there are power-ups and you get quite enough gold to buy them as needed. So now we wait to see where the pirate ship takes us to next. Where ever it goes I can bet there will be zombies there. I liked the interactive mini games but I do not care for the match three. They could dump those games. Rated 5 out of 5 by deddu from THOSE PESKY ZOMBIES They are back and a lot of fun. The levels vary in difficulty -- starting out easy, then a few harder, back to easy and then harder again. Cute story to go along with the play. I've played Chapter 1 and also the original. If you haven't tried those you should as there are unique features in each of them. Rated 5 out of 5 by cowclaudia from Definitely delighted That there's a Zombie Solitaire Chapter 2. I love solitaire games (for the most part - some of them are rather boring) but this is so fun! Follows the same format/criteria as the previous but that doesn't make it the least mundane! You can eliminate those annoying bouncing coins, music is appropriate to the game and not intrusive to it (like some), and it is at times challenging even playing casual mode. I really hope there will be a 3 since it's so refreshing these days to find a really fun game - not the current offerings of doom, gloom, hideous faces and creepy crawlys. Rated 5 out of 5 by marg6043 from Love this sequel I been waiting on this second chapter in the zombie saga since I played the first one. I can not get enough of this game, the story line is what keep me wanting for more games to follow. I hope it doesn't end with this one and a collectors edition will be next. Rated 5 out of 5 by raydog from Terrific game! 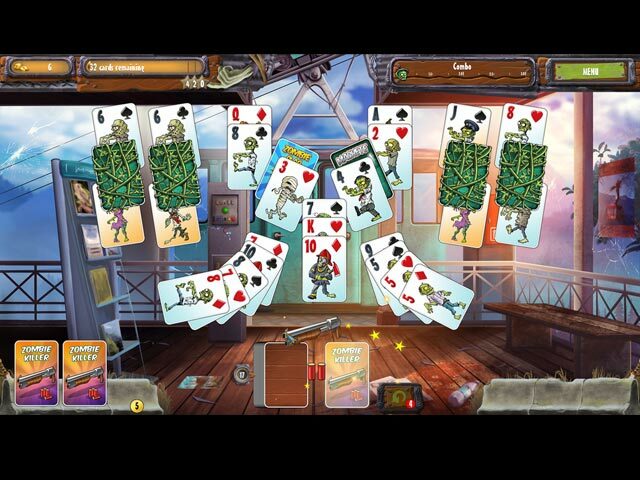 I am always partial to solitaire games but the zombie solitaires top all of them. These levels are a lot harder then the other two zombie games but as long as you use the power ups you can get through them. Love the match 3 side games and the situations you run into. I hope they keep this series going. I didn't bother to play the hour trial. I just purchased the game outright. I knew it was a winner! Rated 5 out of 5 by pennmom36 from .............AND THE ZOMBIE APOCALYPSE CONTINUES In the first Zombie Solitaire, the infamous Tofu Burger, had created a Zombie Virus known as Z1. After surviving all the zombie attacks, you finally made your way to a remote island, seemingly unaffected. As luck would have it, someone snuck in a Tofu Burger, forcing you to flee the island to make your way through thousands of hungry zombies. Rumors were circulating amongst the survivor's, that citizens were being rescued, if you could just make it to the safely of the helicopter landing site, a mere 100 levels away. But this is a Zombie Apocalypse, and that helicopter has crashed, leaving you completely vulnerable to all those bwain lovin' zombies! This is a Higher/Lower type Solitaire game where you try to make large chains of cards either one higher or one lower than the last card. Each card played will give you coins that fall down and bounce all over the place. (this edition allows you to turn this feature off!) Large chains will fill the Combo Meter to earn more points. There is a Star Meter on the top left, that shows how many cards need removed to fill the stars, and for every level you earn with 3 Stars, you will earn an extra Undo. There is even an icon that tells you how many deck cards remain. You can use the coins earned to purchase Bonus Cards, number specific cards and Wildcard Jokers. There are only 3 slots available at any given time for either the Zombie Slap which removes 1 card, the Zombie killer which shoots 2 cards off the board, the Zombie Blaster which removes an entire row of cards, or the Joker Wildcard which is especially helpful to help you continue a large combo chain. Throughout the 100 Solitaire levels, you can earn Sticker Achievements, once you collect all Stickers in a category, you will earn extra coins. There are obstacle cards that require you to first uncover the tool card to unblock them. The Bird Deterrent card releases pesky Infected Bird cards, the Machete Card chops through the Jungle Cards, and the Bolt Cutter cards will remove Chained Cards. You can replay any level, if you aren't satisfied with the score you received. One of my favorite features in this game was Making Choices along the way. You will come across different choice options, which can sideline your own goals, such as choosing whether or not to drink the water. After a few levels, you can play Mini Games and Hidden Object/Fragment Scenes. The Match 3 game is available in Casual or Normal limited moves mode, but in the casual mode, you can only win 1 star vs. up to 3 in normal mode. The goal is to give the Zombies shown, the type of candy they desire by making matches of those specified candies. I found the Match 3 games to be somewhat difficult to earn all 3 stars in Normal mode, but you can replay the Match 3 levels whenever you want, until you get 3 stars. Time to go destroy some zombies before they eat my bwains! Good luck, enjoy! Rated 5 out of 5 by LogieBaby from A remarkable game ( for me ) in a usually boring format Card games that require moving up or down one card at a time ( 3-4-5 etc, ) generally bore me to tears. I may complete a demo if I have time to kill and then move on to something I consider more appealing and more challenging. 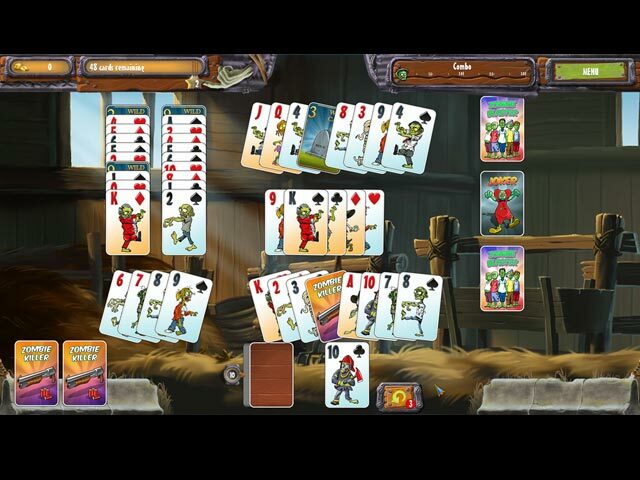 When Zombie Solitaire 2 : Chapter 1 came along about one year ago surprisingly I got HOOKED!!. Now that chapter 2 is available I will acquire it since this installment is as compelling as the first. For starters the game is fun to play and that is good enough in and of itself. Then there is challenge to complete each segment along the journey to salvation. As is the case with all of these card games the player accrues aids such as zombie blasters, machetes, wild cards, keys to unlock blocked cards, etc. While I generally avoid match 3's, the occasional insertion of an M3 is good to break up the repetition of just playing cards. Solitaire aficionados will relish ZS2 and those like me who shun these games should appreciate this outrageously entertaining installment. Rated 5 out of 5 by twtscat48 from Happy Halloween!!! 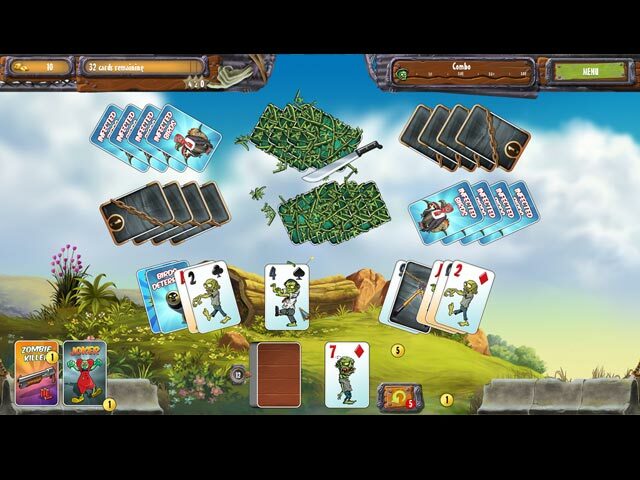 I had downloaded the first Zombie Solitaire and enjoyed it. It's a golf style solitaire, one up or one down, make as long a run as possible. There are power ups or bonuses that can help you along. You can play in a timed mode or what they call normal, or casual mode, there is no time limit for the mini games. If you play in normal mode you only have so much time to finish the game but get more stars. I played in casual mode as I like playing a relaxed game. I did buy the game and would recommend it. Rated 3 out of 5 by CLUELESS35861 from talk about phoning it in... minimal changes from predecessor, changed the backgrounds, switched from hidden object to hide and seek, same old solitaire patterns, a couple of match 3 changes, same 100 point glitch every time you sign back into game, new glitch with the chains, that don't always break and you have to run game out and start over. if you have a free purchase credit, you can do worse, but, I would not spend real credits on it. I mean they really just phoned this in, no effort put in at all!